One of the challenges facing any castle builder is how to make a big gray wall interesting. 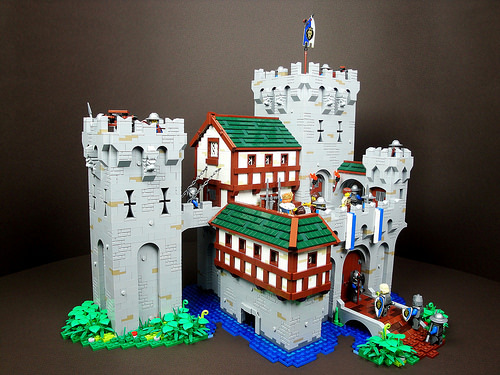 Maxim Baybakov has risen to the challenge with this wonderfully detailed castle. Maxim uses textured bricks, and the occasional side-facing stud to create visual interest, along with some well-placed plates of an alternate color. The same technique on the white walls provides a nice weathered look. Another great detail is the curved windows of the upper towers. But the most interesting design choice — which caught me by surprise — was using window elements turned backward, with the screens on the inside. This simple choice makes the windows seem much more natural in a castle wall. Many thanks for the publication! Very happy!